We know well that moving to a new school is a big step. Our application process aims to be as clear and concise as possible to help you plan effectively. 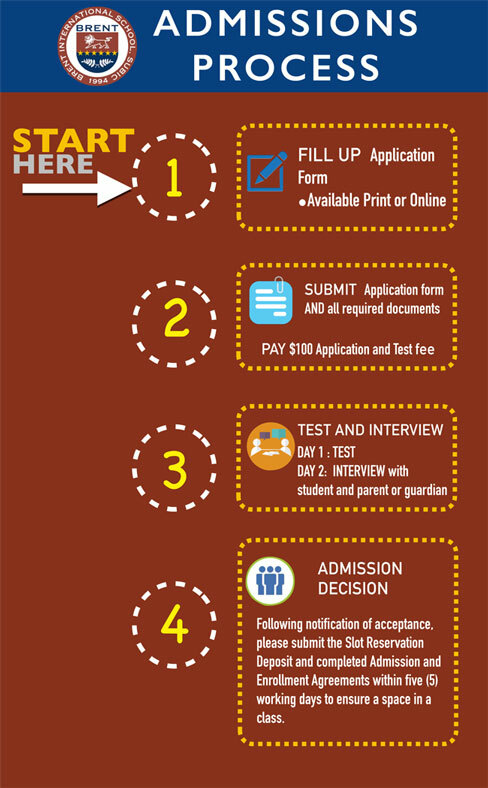 Below you will find an overview of the four steps of our admissions process. Click on the tabs below to find further detail about each step. *These evaluation forms must be accomplished and signed by the appropriate people, and submitted to our office sealed in an envelope. These forms are confidential. Once our Admissions Team has received your complete application, we may proceed with scheduling you for your Testing and Interview dates in your most convenient time. A standardised test measuring academic performance is given to all applicants from Kindergarten through Grade 12. The exam may cover Math, Language and Reading. Applicants who are not native english speakers are also required to take a set of supplemental english language skill assessments. The interview will be with the members from the Admissions Committee and can take up to 1 hour. An applicant is approved for admissions and the family pays the U.S. $500 non-refundable Slot Reservation Deposit. The Admission Agreement from should be signed within three working days from the family’s receipt of the written notice of acceptance. An applicant meets all admissions requirements and is approved for admission, but space is not available in the grade level or program. The family may choose to pay a refundable U.S. $600 to be placed on the wait pool. The applicant will be notified as soon as space becomes available. Brent International School Subic offers no guarantee that a space will open. The name of the applicant will remain on the wait pool (only for the academic year accepted for) until a space opens or the application is withdrawn. An applicant is not approved for admission. The Admissions Committee is not able to predict success for the applicant at Brent International School Subic, either academically or behaviorally. REAPPLYING: A mandatory six-month waiting period is required before a second application. The Admissions Office will keep the original application materials, and there is no need to pay the application fee if admission is sought within one year of the initial application. New academic records, confidential evaluation forms, and entrance tests are usually required for the second application. IB is an internationally recognized and externally examined diploma program. It consists of two‑year courses spread over grades 11 and 12. As a result, it is rare to accept a new student into grade 12, especially in the middle of the year. If a course schedule can be made guaranteeing the student will meet graduation requirements, then an acceptance can be offered.